This is the first banana bread I ever made. 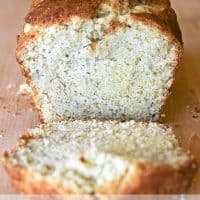 I’ve tried making dozens of banana breads since then, thinking I might find a better recipe than my Grandma’s Banana Bread. 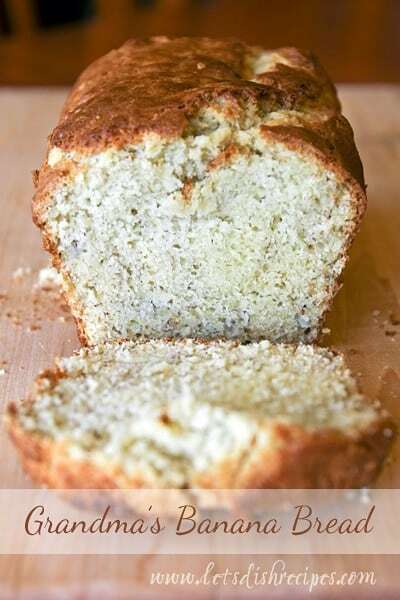 It hasn’t happened yet, and I always come back to this as my no-fail banana bread recipe. I’m not sure (maybe Alton Brown would know) but there must be something about the way the ingredients are combined that makes this banana bread special. We really like it with mini chocolate chips, and sometimes I throw in a dash of cinnamon. It also makes great muffins. In a small bowl, stir together milk and lemon juice; set aside. In a medium bowl, mix flour, baking powder, baking soda and salt. Cream together butter, sugar, eggs and vanilla. Add dry ingredients to creamed mixture and stir to combine. Add milk/lemon juice to mashed bananas, then fold banana mixture into batter. Add nuts or chocolate chips if desired. Spoon batter into a greased loaf pan and bake for about 50 minutes or until toothpick inserted in center comes out clean.